Flowering from January through to April, Dipodium rosem is commonly called the Hyacinth Orchid. 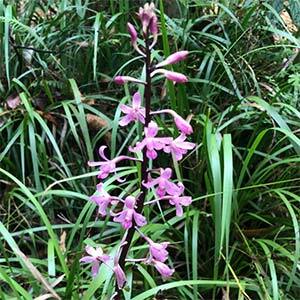 Tall growing native terrestrial orchid, it is leafless, and it is a standout, with its red stem and pink flowers flecked with slightly deeper pink spots. This orchid grows naturally in Eucalyptus forests and is often found close to the trunks of tall trees. The first sign of growth is in late spring to early summer when the flower stems begin to shoot upwards, it is much later that the flowers themselves appear. This leafless orchid relies on its habitat, and that is the stringy bark tree and the fungus that surrounds them. The related species D. pardalinum has more distinct markings and is very rare. You will need to have a stringybark tree (Eucalyptus obliqua or E. baxteri) to grow these orchids. You can’t transplant them and growing from seed is almost impossible, however in the wild they thrive, so appreciate them in their native habitat. Common Name – Hyacinth Orchid. Botanical Name – Dipodium rosem. Position – Full sun to a little shade beneath a stringy bark tree. Flowers – Pink with deeper pink spots. Flowering time – Late summer to autumn. Height – Flower spike to .5 metre. Frost tolerant – Yes, light frosts only. Drought tolerant – Once established.